…are worth a thousand words, or so they say, I thought it would be fun to post some pictures of myself, I know that when I have been following someone else’s blog for a while, any time I can see a picture of the blog author, it’s a treat, so here’s my treat for you. Some of you have been following my ramblings for a year, some for not as long, either way, here I am, now you have a face to go with the words. Just click on the pictures to see the full size image, each picture will open in a new window. 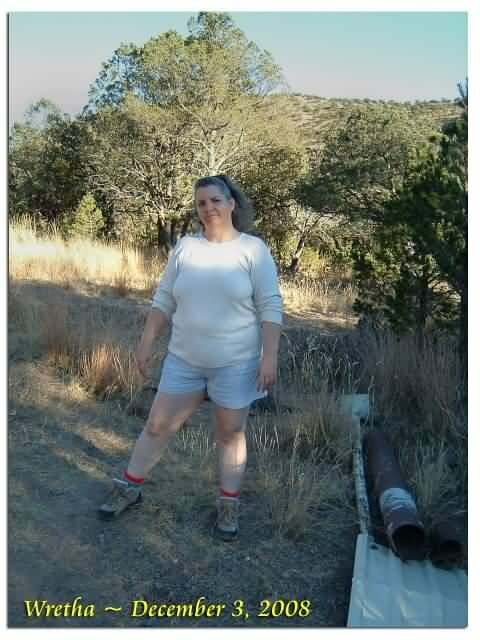 Yes, this is December, and yes I am wearing shorts, sorry if my white legs scare anyone, just be glad you can’t see them up close, the hair would be even scarier! It’s been quite mild during the day, it has been getting up into the 60s, yesterday it got up to 75, but the instant the sun goes down, the freezing temps return, so far the coldest (recent) night has been 22. In the outdoor pix, you can see some of the flora that abounds, pinion pine, alligator juniper, scrub oaks, you can also see some of the native grasses, I don’t know the names of the grasses, some of them grow as tall and sometimes taller than I am. Fortunately they don’t grow so thick that we have to mow, we just leave it natural as possible. This is the inside of the cabin, in the main room. You can see the 12 volt light, this is hooked up directly to the batteries. You can also see one of the power strips that are strategically placed around. We turn off the power strips when we aren’t using whatever is plugged into them. You can also see the center post that helps support the roof, this used to be a tree on our property, now it permanently resides inside the cabin. Gotta watch out for it though, it still exudes sap. 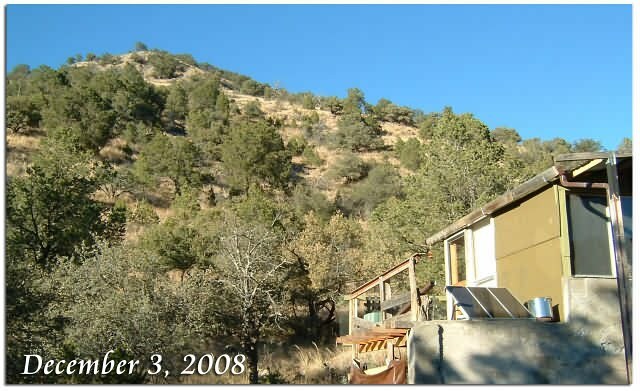 This is the west side of the cabin, as you can see, it’s a work in progress. I don’t mind though, it keeps us warm and dry. You can see the concrete work that Bob has been doing, he has been working hard at it, pouring one layer at a time to build up the walls. Eventually the concrete walls will surround the whole cabin, making it fire resistant, animal resistant, and wind resistant. Those are the main 3 things we have to be concerned about. If you look on the deck, you can also see a set of solar panels, these are charging up a car battery that is sitting under the solar panels. 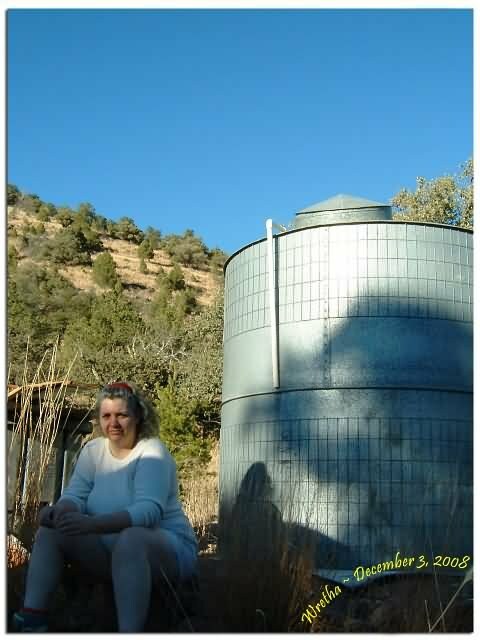 These are a few more pix of myself, in this one, I am sitting next to the water tank our neighbor gave to us. The water tank was rusted pretty badly, the bottom looks like someone took a shotgun to it. We lined it with FRP and heavy builder’s plastic. It originally held about 1000 gallons of water, now it holds maybe 600 gallons. We used this to water our garden at the beginning of last summer, before the rainy season hit. In this picture, I am facing east, and not doing much else. You can see the other two water tanks we have, all of these have holes of some sort, we plan on lining them with something so that we can use them during the next rainy season to contain the abundant rain that falls. I am leaning on the third tank trying to look “distant”. Wow, what a change a few days make! It went from shorts weather to full on gotta get the quilted coveralls, it snowed yesterday. Actually it rained yesterday morning before the sun came up. Then it turned into snow. We didn’t get much snow as you can see in the picture, but it was enough to make things look pretty. It’s amazing how a light dusting of snow can transform the most mundane objects. The last few days have been overcast, that doesn’t work well with the solar panels. We have had to really conserve power, that puts a big dent in my computer and internet time. Oh well, fortunately the sun comes back out in pretty short order around here. Today is sunny and clear. The morning started out at 19 degrees F, but it has warmed up to a balmy 40 degrees F.
1! I don’t think the googleplus 1 was successful to tell the truth, some sort of error. But at least I tried, right? That’s what is important. Please keep putting out articles like this and your site is going to be at the top very quickly! Awesome pictures! Thanks for sharing with us, your journey is very inspirational. Sandra, this can be paradise or hell, depending on what you want in life. If you are used to going to the mall, going to the 7-Eleven late at night to get a snack, eating a take out hamburger just up the street, then this place will be terrible for you. If you are looking for peace, solitude, quiet, clear skies, mom-n-pop stores that close early but they know your name when you come in, spending hours on the porch of the local store chatting with everyone, cold nights, warm days, rainy season in the late summer, not much rain the rest of the year, dust and grit that gets into everything no matter what you do… then you will love it out here. The hardest part for us, I’d say, is not having our families close by, I wish I could get both sides of our families to move out here, but I don’t see that happening, so we will just have to be happy with short visits. What makes it worth it is getting to live our dream life, to me this is a fantasy come true, I have wanted to live “off the land” or at least as close as possible as far back as I can remember, cooking from scratch, canning, growing our own food, making our own power, being independent, and not having to spend a lot of $$$ to do it. What would you say is the most difficult/challenging part of your life there? What are your favorite parts that make it all worth while? Thanks Chris, there are a couple that is 12 volt. 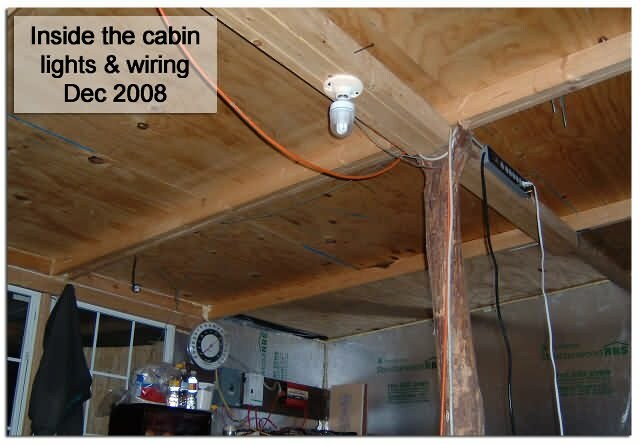 you can see one in the picture of the inside of the cabin, it is hooked up directly to the batteries, all the other lights are regular CFLs. 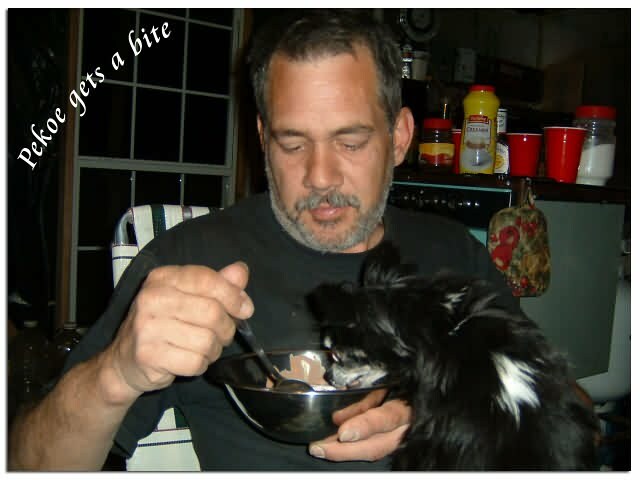 Your kinda place huh… hehehehe, you a redneck too? Great pictures Wretha I love them all. That’s my kinda place for sure. Are any of your lights 12 volt DC?? That would be great, no power lose through and inverter.